Nicole Grebosz, technology special area teacher from Citrus Grove Elementary School, is Volusia County Schools' Teacher of the Year for 2019. She will serve as Volusia County’s Teacher of the Year for one year, representing all of Volusia’s teachers. Ms. Grebosz received this award before an audience of more than 900 friends of public education at the Hilton Daytona Beach Oceanfront Resort on Friday, January 12, 2018. 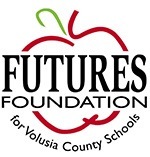 The announcement was made at a celebration presented by Halifax Health and co-hosted by FUTURES Foundation and Volusia County Schools. Ms. Grebosz earned her bachelor and master degrees from Stetson University and began her career with Volusia County Schools in 2006 at her alma mater, Pine Ridge High. She served as an English/Language Arts teacher, as well as the sports science/emergency medical services academy teacher, until 2008. She then became a career and technical education teacher at Pine Ridge, but also taught a web design class part-time for a few months at Florida Virtual School. In 2015, she made the leap to elementary, accepting a technology special area position at Citrus Grove Elementary. As a technology teacher, which is a new offering at the elementary level, Ms. Grebosz teaches 900 students in grades K-5 and serves as a mentor to teachers who are new to teaching technology as a special area. When her fifth grade students graduate, she measures her success by their ability to navigate technology tools and their confidence in their abilities. That success is supported by the 40% pass rate of the fifth grade students who participated in the iC3 Spark digital tools certificate, which is an assessment designed for middle schoolers. Ms. Grebosz has served as a member of school leadership teams, sponsored clubs at the elementary and high school level, planned large schoolwide events, held leadership roles at the school and district level, presented at state conventions and served on a Florida Department of Education committee to redesign course frameworks for Business Supervision. She believes in giving back to her community, both in and out of school; and that the charge of every teacher is to empower students as learners and help them find and develop their voices. Described as versatile, flexible and someone who makes the community a better place to live and work, Ms. Grebosz succeeds Jason Kester, culinary arts teacher from Mainland High School, who was Volusia County's 2018 Teacher of the Year. Lisa Nix, kindergarten teacher at Friendship Elementary – Guiding Principle #1, Dedication to Increased Student Achievement. Lisa knows kindergarten is the foundation of learning. She monitors student growth and makes adjustments to meet her student’s needs, so they are prepared for first grade. Those “ah ha” moments throughout the year are proof that students are making connections and showing their excitement for learning. Tonya Knight, academic coach at Campbell Middle – Guiding Principle #2, Commitment to Finding Solutions to Problems. She put in a lot of hard work and dedication to lead the Civics Professional Learning Community to success. This team of teachers collaborated weekly, implementing a plan to ensure they had all of the resources, knowledge and support needed to deliver standards-aligned instruction. This resulted in rigorous lessons and an amazing increase of 27 percent on the Civics end of course exam. John Scrivano, English IV honors teacher at New Smyrna Beach High - Guiding Principle #3, Mutual Respect and Positive Relationships with all Stakeholders. John invests his time with students, but not just for nine months. His investment is for a lifetime. He attends college graduations, is a godparent to many of his past students’ children, has walked students down the aisle in their weddings, and visited their homes across the country. He takes pride in creating bonds, both personally and academically, with his students. He feels privileged to be a teacher, believes is it the most important job in the world, and loves what he does. Major sponsors of the Teacher of the Year celebration included Presenting Sponsor Halifax Health, Vehicle Sponsors Diamond Motors & Marine and Daytona Mitsubishi/Kia, Gold Sponsors LEGOLAND Florida, PNC Bank and Volusia United Educators. Silver Sponsors are BRPH Architects – Engineers, Inc., Centra Care/Florida Hospital Urgent Care, Chick-Fil-A, Daytona International Speedway, Florida Credit Union, Giles Electric Company, Inc., Dr. Robert & Candace Lankford, Launch Federal Credit Union, Leonard’s Studios, Mainstreet Community Bank of Florida, Publix Super Markets Charities, Rhodes + Brito Architects, Rue & Ziffra, University of Central Florida, and VyStar Credit Union. 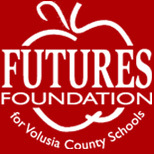 Bronze sponsors included William & Linda Cuthbert, Intracoastal Bank, Malcolm L. Daigle & Associates, Inc., Mathnasium.online, PDK – Phi Delta Kappa East Central Florida Chapter 1345, Carl & Susan Persis, TD Bank, VASA – Volusia Association of School Administrators; Volusia County Council of PTAs, Volusia County Sheriff Michael J. Chitwood, Weston & Gregory, PA, CPAs, and Arthur & Ida Wright. FUTURES Regent’s Club Members who serve as sponsors for all events are Bank of America, Cobb Cole, Daytona International Auto Mall, Duke Energy, Florida Health Care Plans, Florida Hospital, Florida Power & Light, Halifax Health and Wells Fargo while Brown & Brown of Florida, Inc., Mr. and Mrs. J. Hyatt Brown, Daytona International Speedway, SGM Engineering and SunTrust Foundation serve as a Chancellor’s Club Members for 2017-18. Leading the in-kind sponsorships is Craig Conway of Diamond Motors & Marine and Daytona Mitsubishi/Kia who provides the use of a new automobile to the Teacher of the Year during his/her reign. This is Mr. Conway’s eighth year in supplying a vehicle. Additional in-kind sponsors include Barnes & Noble, Dean Stewart Photography, Duke Energy, Embry-Riddle Aeronautical University, Express Printing, Herff Jones, Hilton Daytona Beach Oceanfront Resort, Jostens Inc., Kuhn Flowers, LEGOLAND Florida, Mainstreet Community Bank, Merlin Entertainments, Nina B. Hollis Institute at Stetson University and Wishworks Media.